This really should be called a BLCT as one of its main ingredients is cheese, not to mention that the lettuce in this is really basil leaves. So it may not be the most traditional BLT, but it's my favorite. What makes it special are the thick slices of homegrown tomatoes and the creamy burrata cheese. 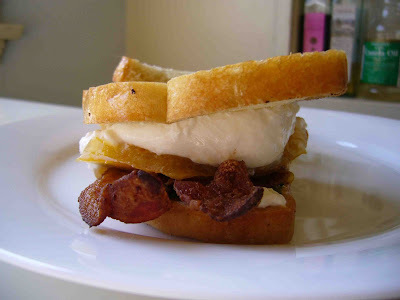 I think everybody has their own way of making a BLT and this is mine. What's yours? This is how I get bacon to come out crispy and golden every time. Preheat oven to 375*. 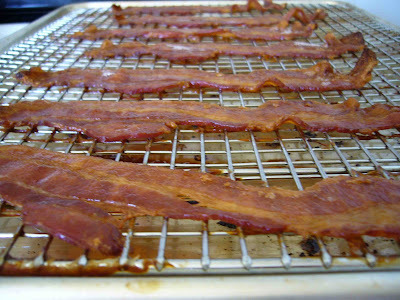 Place a cooling rack over a sheet pan or cookie sheet with an edge and lay bacon strips on the rack. Place in the oven for 20 - 35 minutes until golden and crispy. oh my, that looks gooood. this looks so sinfully delicious! Oh - I love this! YUM!